Understanding MLB Odds is critical to becoming a successful sports bettor. Unlike football and basketball where you are betting against a spread, baseball is an odds based sport, which means that you only have to pick the winner. To compare today’s lines against 6 of the top sportsbooks in the world, go to Baseball Betting Odds. Lines makers take many factors into consideration in determining the lines for a baseball game such as starting pitchers, bullpens, history between the two teams, home field, and the opinion of the betting public. Betting the favourite to win the game. Novice bettors have a difficult time getting over the fact that the favourite is supposed to win and the underdog is supposed to lose. On the other hand, instead of predicting who will win the game, experts look for “value”. Taking the “over” bets on the totals line. The public love hitting. Putting too much value on an elite starting pitcher. Ignoring the value of bullpen pitching. Knowing that there will be lots of action on certain teams, lines makers will often “shade” the lines towards favourites. What this means, for the smart bettor, is that there will often be more “value” betting the underdogs or taking the “under” on the totals line. Once the lines makers establish the MLB odds, the lines can move if there is a lot of early action by experts (aka wise guys or smart money) or if the betting public wagers a substantial amount of money on one team. Understanding MLB odds can be tricky at first, but after while, they become quite easy. If you’re new to MLB lines, take a look at Reading Baseball Lines. Experts find baseball easy to handicap. However, for novice bettors, baseball can be a tough sport to handicap. 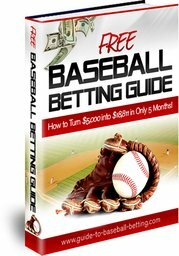 To learn what to look for when handicapping, take a look at How to Bet Baseball. Gambling professionals use powerful baseball betting systems and money management strategies to help them win consistently. To learn what systems the pros use, visit Baseball Betting Systems. Understanding and comparing MLB Odds & Lines is an important first step in your evolution to become a profitable bettor.